Hi Joanne! You're not the only one! I've been TERRIBLE at hopping about lately! Life's gotten so busy--nice to know it is for all of us, isn't it?! LOVE this card! I am a fanatic for fonts too--I adore them! Choosing the right one is so important to me, too! I've got books on fonts, thousands saved on my computer...I'm a bit insane! I love old style fonts the most--probably a big shock, right?! Hope you're having a lovely Christmas time--we'll get more on track after the holidays, never fear! Great stamp block. 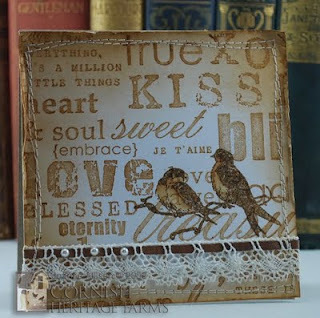 like the combo of the stamps and lace. Lovely card! I would absolutely use it for a wedding. Such serene tones and the lovebirds are gorgeous. Good to see you are using your secret santa gifts already Joanne. That card is great. This is beautiful, just love the birds. Happy New Year Joanne and keep the brilliant work coming.